Gemeinsam mit ihrer Familie musste die zweijährige Edith Kurcz aus Österreich fliehen. Von Wien über Paris ging es weiter mit dem Schiff nach Lissabon, wo die Familie bis 1940 leben konnte. Die Angst, dass Hitler die iberische Halbeinsel einnehmen wird, wurde immer größer und so wanderte die Familie 1940 in die USA aus. "Our rather privileged life was shattered irrevocably in March 1938, when Hitler annexed Austria." Die Lebensgeschichte von Edith Jayne wurde von ihr persönlich verfasst. I was born in Vienna, Austria on 9th June, 1936. We lived at that time in Hitzing, In Marzstrasse 84. I was named by my sister, then known as Liselotte, but now Lisa, who wanted a ‘Ditta’ (the diminutive in German for Edith). As she was always rather a strong character she got her way and that is what I was named. I joined my parents and older sister in an apartment and office near Schoenbrun Castle in suburban Vienna where my Father had a position as a family Doctor (or more accurately Frauen und Kinder Arzt). My parents were Maria Rixner and Rudolf Kurcz – both born in parts of the Austro-Hungarian / Hapsburg Empire at the beginning of the 20th Century (after WW1 this became respectively Czechoslovakia and Hungary though they were both from Austrian parentage). It was a ‘mixed marriage’ – my mother being a Roman Catholic and my father Jewish – not really very important then as neither was religious, but soon to become rather more pertinent. My sister and I were cared for by my Mother as well as a nursemaid and we also often visited our grandmothers (they were both widowed), as well as other relations nearby. Our rather privileged life was shattered irrevocably in March 1938 when Hitler annexed Austria. My Father’s job was terminated forthwith and our home appropriated by the Nazis for use as a local party headquarters. 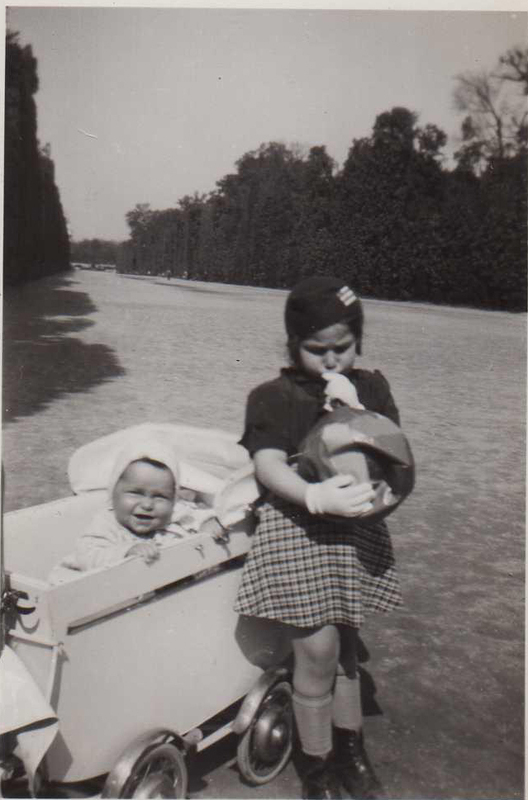 My sister and I were shipped out to grandmothers (first the Catholic one, then when they declared that Korneuburg needed to be ‘judenrein’, we went to our Jewish Grandma) while my parents sorted out where and how we could emigrate. 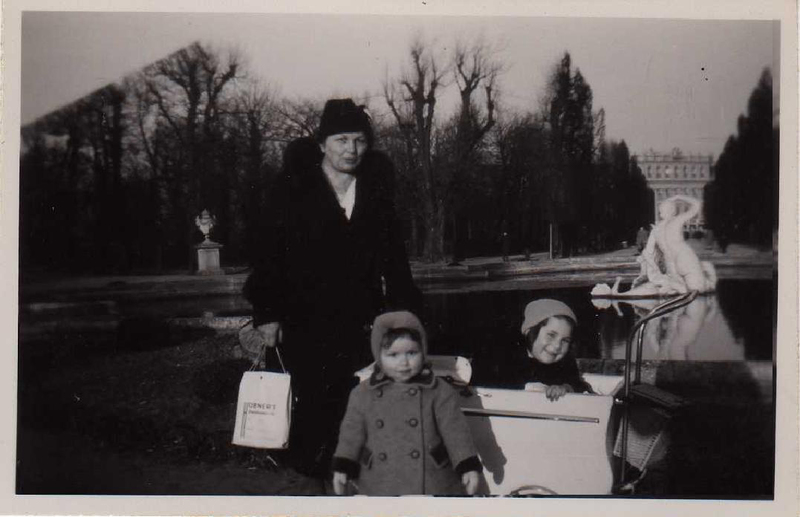 We had a sponsor and three out of the four visas to get to America but the fourth one was unavailable (the Hungarian quota was full) and my mother refused to split the family so we embarked (overland to Paris and then by sea) to Lisbon to join my maternal aunt and uncle- and my cousin Paul. I clearly picked up on the anxieties of the grownups though no one explained to me why we were suddenly homeless. We left Vienna in June 1938 and arrived in Portugal by early August (the Spanish civil war was still in progress which is why we could not get to Portugal by train). They were wonderfully welcoming although squashing us all into their tiny flat was quite an ordeal. Portugal itself had a long history of tolerance of outsiders/immigrants. My Father could work as a doctor for a Jewish welfare agency (though not in private practice as he had no Portuguese license/ registration as a doctor). refugees to emigrate to America by ‘borrowing’ quotas from subsequent years (1947 I believe for my father) and in May 1941 we embarked by sea for the USA. I remember the journey quite vividly – I have a few snatched memories of Portugal but really my major remembering was from about age four or four and a half and the trip to America was certainly an exciting turning point. We went on an American liner converted into dormitory accommodation for refugees. I had my first taste of corn flakes as we ordered it and the strawberries every day for breakfast – ate the strawberries and left the flakes! I once explained to someone that I never quite ‘fit in’ regarding food and ways of eating – I’m always a continent behind somehow (eating now in American style -ways of holding knife and fork, although my parents tried hard to get us to eat European fashion – different again from English style which I’ve never totally mastered either). And as far as food is concerned – we were chauvinistic – eschewing peanut butter and catsup which were considered barbarian intrusions to the Austrian palate. Anyway to get back to the journey – it was quite exciting because we had escorts for safety (WWII being in full swing in Europe) and also gang warfare amongst the children – refugees/immigrants vs. Nazis and we had Paper Cup assaults on each other. We did disembark this German contingent in Bermuda as their parents genuinely were spies and the British interned them there. We sailed into New York harbour after an eventful 12 day journey and were awed by the Statue of Liberty and our new life to come. A friend of our parents from Austria and Portugal who had preceded us to New York met us and had rented us a one-bedroom apartment off Broadway on the West Side and we settled into trying to make a new life in a new country and yet another new language! My mother took work in a factory and we lived on her wages of $14 a week for the five of us. My Father tried to learn English as fast as he could for he had to pass the New York State medical exams to re-qualify as a doctor – learning everything all over again in English. The area where we lived had a high level of immigrants and German was nearly as frequently heard as English – we met many old friends again from Vienna or Lisbon and also picked up others by sharing a mother tongue. My friends, the Preminger’s were acquired this way – Omi and Kate accidentally sharing a park bench in Riverside Park while they supervised Lisa and I and Eve and falling into conversation when we all turned out to be talking in German (with Viennese dialect yet!). So a life-long friendship was begun – they too having left Vienna at the time of the Anschluss. Lisa and I started school in September – she third grade and I Kindergarten. I remember being terrified that I’d need to go to the toilet and not be able to make my needs known as I still spoke virtually no English. But the teachers were incredibly kind and patient and took it upon themselves to teach me the language by doing ten minute naming sessions of objects. I remember being very proud of myself and teaching my mother when I got home and she got back from work. (“This is an apron” , “what is this?” “an apron” etc.) I loved school and somehow they must have got it over to the other children that they needed to help rather than laugh at me because they were kind and helpful and named things for me as we played. Within six months Lisa and I were talking in English to each other though the home language was still German. This was helped of course because by this time America was at war and we didn’t want to be speaking the enemy’s language—at least in public! I remember Pearl Harbour Day distinctly (Dec 7 1941) and the hope we had that it meant America would also join in the European War and help defeat Hitler. Growing up in wartime New York was quite a different experience from those of my European contemporaries. There was rationing but nowhere near as that in England – steak was only available perhaps once or twice a week but as we could not afford it at this time in any case, that was rather academic. Meat was available – just more of the off-cuts as the steaks were earmarked for the military personnel. Consumer durables were unavailable as the manufacturers were all into armament and war products instead. Clothes were available but with restricted choice. In any case Mother sewed most of our clothes and fabric was quite easily obtainable. Occasionally there were queues for rare commodities – once while on holiday in New Hampshire we found ourselves in such a ‘line’ which turned out to be for clothes pegs which we didn’t need as we had no washing line in our apartment building in NYC. We did have air raid drills and there were air raid sirens and blackout curtains – I remember these in school where we all went into the basement and sat cross-legged on the floor singing songs such as “Deep in the heart of Texas” and “Don’t sit under the apple tree” to keep up our spirits. Some of my friends had fathers who were in the services but mostly they were a bit too old to enlist and besides had too many dependents so were not drafted. We did get occasional reports through the Red Cross about relatives still in Vienna (like my great-grandmother who had diabetes and was interned when she was 87 and died soon thereafter) – many of my father’s family had fled though – one family to China (Shanghai) where they survived the ghetto/war , one to Palestine, and three to America. All his cousins who lived in Hungary though died in concentration camps – which we only found out about after the war. By 1942 my father had re-qualified and we moved to West End Avenue. He was able to purchase a car as he was in a restricted occupation that got gas coupons so we had our first Buick. My mother was able to stop being a factory hand (she had worked in candy manufacture, sewing varying styles / clothes including funeral clothes until she realised what she was making and changed jobs). The lingua franca in the dress business was Yiddish (by the owners) and Spanish, or Italian or German and Yiddish with a smattering of New York dialects by the workers – so much of my Mother’s learning of English was through us and in night school. Most of my parent’s friends were fellow refugees – their first close American friendship not happening until the 1950s. My sister and I flourished at Public School 9 Manhattan. We regularly won the ‘Blue Ribbons’ (for coming top of our respective classes) and enjoyed the work. I remember it fondly – very progressive and interesting teachers and innovative curriculum and teaching methods (The John Dewey influence of progressive child-centred education) with project work and research skills from about third grade and creative writing. I made some close and abiding friendships there. It was a typical urban school – with no playground or outdoor play space and little inside either. The neighbourhood was a mixture of affluent middle class, mainly Jews, and working class Irish Catholics. I didn’t fit neatly into either category as though ‘middle class’ by virtue of my Father’s occupation, we were still quite poor and my sister and I were being sent for Catholic instruction and went to Mass though we had little in common with the other children there. I wonder if my feeling of a permanent ‘outsider’ stems from this time. My Sister preceded me to Hunter College High School– it being one of two selective schools we were eligible to attend if we passed the entrance exams. That was a superb grounding – all the girls were bright and committed to learning and we had an unusually well qualified staff – a number of the teachers having PhDs. It was extremely hard work – most nights throughout all four years we had 3 hours or more of homework but they also taught us study skills and learning how to learn and we thrived. It is interesting that in 2001 one of the Hunter College High School alumnae who live in London started a Hunter C.H.S. 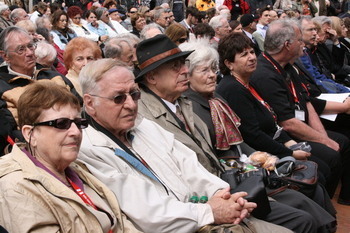 Holocaust Survivor’s webpage with a dozen or so of us contributing our experiences to it. At the time we were in High School we never shared any of these experiences with anyone – perhaps instinctively recognising a fellow immigrant, or Viennese but never discussing or talking about our experiences. I graduated from Barnard – the women’s college of Columbia University and one of the Ivy League (7 sister colleges) which was wonderful. I took a degree with honours in Psychology and Sociology and graduated in 1957. I had wanted to go to Law School but by that time I was married and I didn’t deem that a feasible career choice – too expensive, too long and probably incompatible with family rearing. So I took a teacher training qualification and Masters Degree in Early Childhood Education and began teaching in 1958 – quitting when I was pregnant with Ted who was born in 1961. My husband worked in computing at IBM and I attempted to be an IBM wife (there were strict unwritten rules about corporate wives and in those days quite old fashioned ideas of necessity for men wearing white shirts, secretaries resigning on marriage, and pay checks never being cashed in bars – IBMers were supposed to be sober). Motherhood was for me at first a very difficult role to take on but once we moved into our own house in suburbia (in beloved Larchmont) – and I acquired a circle of other Mums to socialise with – very enjoyable indeed. Summers were wonderful as we had rights to join the beach club and on nice days we spent hours at the beach with a coterie of toddlers. My younger son, Richard was born in 1964. By 1966 however my husband had itchy feet and accepted a job in Europe moving us eventually to Brussels with Union Carbide Corporation. It was a testing time for us all – none of us spoke French, he was never there, the children were unhappy and ill and I found it exceedingly difficult with no support mechanisms, not able to speak the language and feeling insecure and unhappy – a reversion to childhood experiences of terror and fear engendered during our emigration experiences some 30 years before fleeing the Nazis. After six miserable months I announced my intention to return to America and my husband eventually was able to persuade his employer to move us to London. We found a gorgeous flat on Exhibition Road in South Kensington and very quickly settled in- all finding friends and enjoying what was expected to be a three-year stint. I’m still here in England – about fifteen miles from where we lived then. Rather a lot has happened in-between. The marriage disintegrated in 1972 and divorce followed in 1973. I remarried in 1975 and we moved to Dulwich. I made lots of friends and work was quite satisfying – I worked for the Inner London Education Authority in their Research & Statistics Branch as a research officer. The boys did quite well and made friends. I then in 1981 started working as a lecturer and then senior lecturer at Thames Polytechnic (having taken another degree – an M.Sc. in Organisational Psychology) and spent the next 20+ years as an academic in higher education moving to Exeter University and then The College of St Mark and St John in Plymouth teaching primary education and management and leadership in education. The move to Devon was not a particularly wise one; my husband was made redundant a year after we moved and my job, though prestigious was not a happy one – the University being a difficult one for women to operate in and not accepting of ‘minority groups’ of any kind– with a strong Masonic culture. I really didn’t ‘fit’ their profile; ‘Marjons’ was a happier employee experience. I also worked part time for the Open University teaching both in their Education and Business Faculties. – in Devon and then again in London when I returned (out of ‘exile’ as I wryly put it) once my husband had died and I was on my own again. Returning to the London area was wonderful and I settled happily in the Kingston area to be near my granddaughter. That’s all the factual/historical bits but the personal, bits are another story too. I have all my life been an enthusiast for dance (particularly ballet) and an avid theatre-goer. We also had subscriptions at various times to opera (the Metropolitan in New York) and concerts. And I am an avid art gallery visitor – from high school days when we used to wander into the Frick Collection on the way home from school or the Metropolitan Museum of Art. I also used my baby-sitting money to get into the Museum of Modern Art (the only one you had to pay for in those days) and loved the Picasso, Braque and Kandinsky paintings. As I said earlier, I have always been interested too in political action – particularly civil rights and equality and am highly perturbed at the bad press asylum seekers have just now as some 60 years ago I was one of those. I’m also a jazz fan and love going to performances. In my youth I attended live performances of Count Basie, Billy Eckstein and Ella Fitzgerald, the Stan Getz Quartet and others of that era including the Modern Jazz Quartet. I still love this form of music and have an equal number of classical and jazz CDs – though none of pop music which somehow I don’t understand or like. And my husband once accused me of inveterate course attending –I suppose learning is a hobby of mine. I’m still fascinated by a variety of things – I suppose that’s why I have always loved teaching – I learn so much from my students and from their and other’s ideas. So having joined U3A (University of the Third Age) recently – I’m re-learning German conversation as well as creative writing and we also have a lively jazz group that listens to CDs and tapes. It just seems there is still so much to explore and learn about. I’ve also discovered the pleasure of exercise– enjoying Pilates (a specific form of exercise) and Aqua-fit. Where does religion fit into all this and how come I joined the Association of Jewish Refugees? As I said at the outset- neither of my parents was particularly religious, and I’m not quite sure why we started attending Catholic instruction – perhaps really because my Sister had had her first Communion while in Portugal (It was a German Catholic School she attended) and she wanted to continue going. It was held once a week at the church from 2-3 pm and we were let off out from our school to attend. I continued to go and attend Mass on Sundays to keep my sister company but stopped abruptly when I was 13 saying I no longer believed in all the mumbo jumbo (Latin mass). At University I tried out others – certainly the Jewish ‘Chaplin’ gave the most interesting sermons. Most of my childhood friends were either Jewish or half-Jewish, though few were actively religious. I certainly feel I have both Jewish and Christian heritage and through babysitting for an Orthodox Rabbi’s family, I am well versed in principles of keeping kosher. Growing up in New York too Jewish humour pervaded. I didn’t join any faith community though until about ten years ago when I began attending Quaker Meetings for Worship and continued when I moved to Hampton Wick. I currently am the Quaker representative on Kingston’s Interfaith Forum and have since 2005 been on the Holocaust Memorial Day sub-committee. As to the AJR connection, I was attempting to get an Austrian Holocaust Survivors pension when I heard that was possible (when I became 65) and found the German bureaucratise of the forms incomprehensible. I asked the Embassy for assistance and they put me on to Michael Newman and the AJR who were extremely helpful. Having got the pension - it seemed churlish not to join and in any case I do feel we have some shared experiences. The whole question of identity and belonging is also perhaps a common one – I am on my third nationality; and feel I don’t specifically belong anywhere. I feel strong allegiances both to America and to Europe and now particularly to Britain as well having lived here longer than anywhere else. I don’t really feel Austrian and have a love/hate relationship really though I have been to visit more recently and think I have finally come to terms with my country of origin. And I am still passionate about defending freedom, equality and justice and combating racism and other ‘isms’ including of course anti-Semitism.